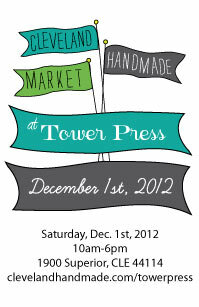 The holidays are quickly approaching so I thought I'd let you know about the handmade markets where you can find me! This week opens the Made in the 216 Holiday Shoppe that I mentioned last week! You can also find me along with lots of other great makers at the Cleveland Handmade Market on Saturday, December 1st 10:00-6:00 at the Tower Press. And my final show this season I am teaming up with one of my best friends at the Last Minute Market in the Screw Factory in Lakewood. Saturday, December 15th from 10:00-6:00. It's always a great show so please come on out and support local arts! Have a happy Monday! I hope you all have a short work week!